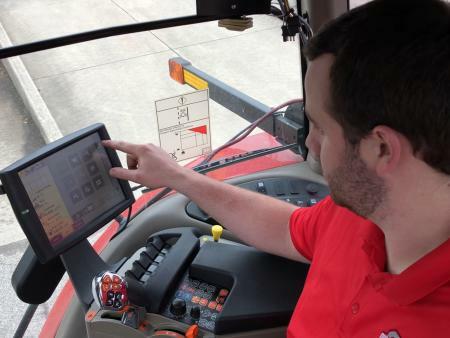 “Precision agriculture is just another example of how Ohio State University is addressing grand challenges,” said Dr. Elizabeth Hawkins, Assistant Professor and Field Specialist, Ohio State University Extension. Precision Agriculture at The Ohio State University focuses on developing precision nutrient management strategies and technologies to improve efficiency of fertilizer placement, enabling on-farm evaluation, automating machine functionality, enhancing placement of pesticides and seed, developing analytical tools for digital agriculture, and more. Advancing research and technology will help farmers optimize their productivity potential. As the world’s population continues to grow over the next 50 years, it is estimated that agricultural production will have to double in order to meet the growing demand for food and changing dietary preferences. Technologies and research being developed by Ohio State’s Precision Agriculture Program will help farmers reach this level of production while maintaining our current natural resource base. “Ohio State University is well positioned to lead given the breadth of our faculty expertise, our excellent county-level extension education network, and our connection with the private sector,” said Dr. Scott Shearer, Chair and Professor of the Department of Food, Agricultural, and Biological Engineering. In an effort to give Ohio farmers access to actionable information and data-driven results from precision agriculture research studies, the Precision Agriculture Program recently released the 2017 eFields Report. Ohio State Precision Agriculture has also been recognized this past year for its world record for most data collected from a single corn plant, demonstration of a multi-hybrid seeding prescription to create the university’s primary athletic logo in a cornfield, and their recent Precision University on nutrient management. Follow the team on Facebook, Twitter, and Instagram and sign up for quarterly updates from the precision agriculture program here.